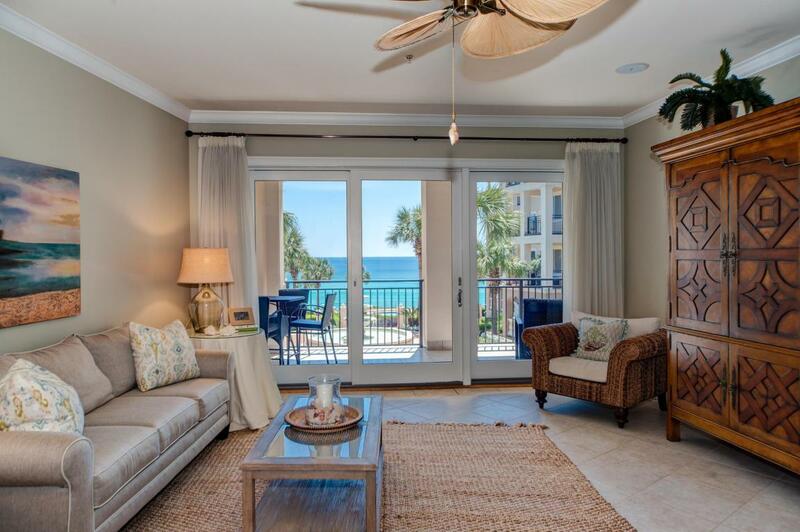 Upon entering the foyer of B202, you are at once captivated by the Piazza and azure Gulf views. 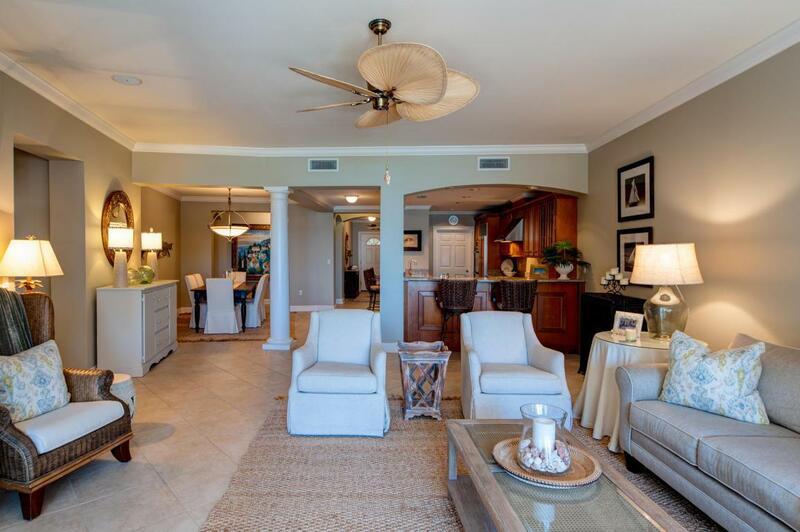 This immaculate second floor Bella Vita residence, with a graceful 239 square foot veranda is offered by the original owner and is beautifully furnished. Immaculate and never rented! Lush, landscaped gardens, fountain, pools and the Gulf of Mexico unfold before your eyes and enliven the senses. 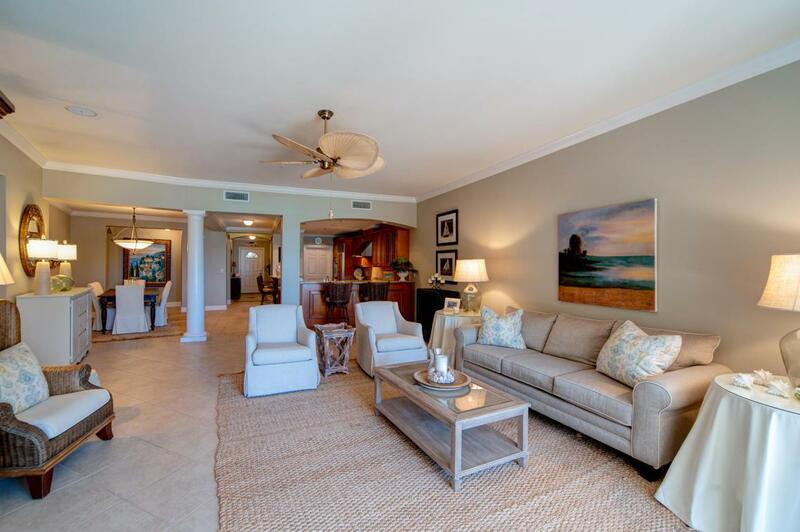 You will enjoy 365 feet of beach and two picturesque swimming pools of which one is heated. The interior detailing includes arches, raised ceilings, crown molding, and hard surface floors throughout. There is new flooring in the bedrooms. 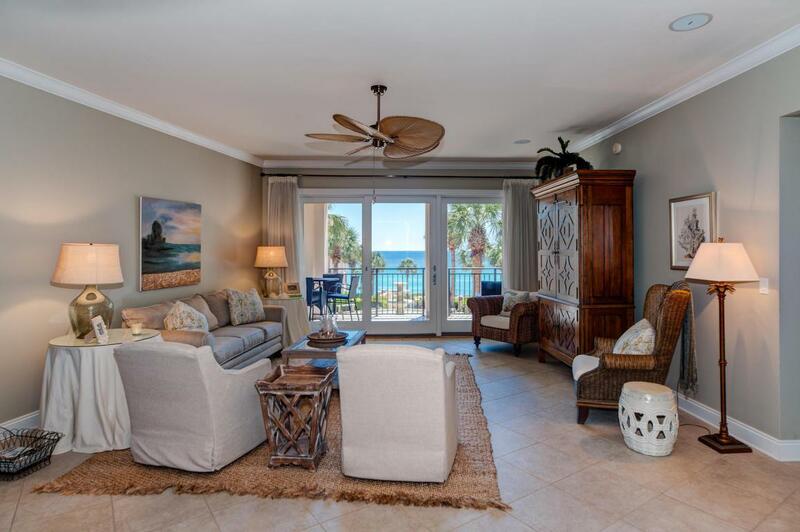 The Linn's Prestige Designer Kitchen with gas cooking, custom cabinetry, two breakfast bars, double oven, and high end appliances makes entertaining effortless.Wake up to Gulf Views! The Master Bedroom lets on to the veranda and features two well located, large walk-in closets. There is wiring for speakers in the living, dining and master suite. Beautiful Master Bath offers separate his and hers vanity sinks, whirlpool tub, separate shower, tumbled tile accents, linen and water closet, and custom wood cabinetry. Desirous floor plan features separate dining and the kitchen with adjoining Laundry Room. The Split Plan offers large en suite Guest Bedrooms affording privacy for guests and owners alike. B202 offers ample storage inside and out with a private storage closet, ample parking, and additional common area owner storage in Building A. Bella Vita is designated by the U.S. Dept. of Natural Resources as the highest elevation on the entire Gulf Rim between Key West and Mexico sitting approximately 61 feet above sea level at the Piazza's custom fountain. B202 is located in the B Building so owners enjoy the added convenience of the Porte Cochere Entry at the Great Hall with Library, Kitchen, Mailboxes, Two Elevators and the fabulous Fitness Center is steps from your door. We invite you to make an appointment to see B202 and begin to live the Beautiful Life at Bella Vita!